PAK TAKES STAND AT easyFairs 2010 | PAK Automation Ltd. 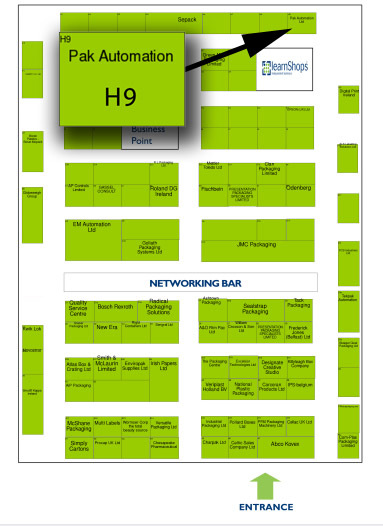 Stand H9 is the stand to visit at this year’s easyFairs’ PACKAGING INNOVATIONS IRELAND show at the RDS on June 16th and 17th. With an exciting display of the latest in automated machinery, packaging technology and robotics PAK Managing Director Michael McHugh will be on hand to answer questions you may have about processing technology and the benefits automation can bring to your operation. On show will be Kawasaki’s new Pick and Place Delta Robot. easyFairs PACKAGING IRELAND is a trade-only event where FMCG manufacturers, marketers and retailers get a chance to meet, source solutions and strike up relationships with future suppliers. The RDS is situated in Ballsbridge, Dublin 4. It is located on a 42-acre site between The Four Seasons Hotel and Herbert Park on Merrion Road.